We've partnered with other browsers and the web community in adopting MDN Web Docs as the definitive place for useful, unbiased, browser-agnostic documentation for current and emerging standards-based web technologies. You can find details about EdgeHTML API support directly in each page of the MDN web reference library. Visit Microsoft Edge's Platform status for the latest features supported in Microsoft Edge. EdgeHTML 18 includes the following new and updated features shipped in the current release of the Microsoft Edge platform, as of the Windows 10 October 2018 Update (10/2018, Build 17763). For changes in specific Windows Insider Preview builds, see the Microsoft Edge Changelog and What's New in EdgeHTML. Here's the permalink for the following list of changes: https://aka.ms/devguide_edgehtml_18. With the Windows 10 October 2018 Update, Microsoft Edge provides customers with the ability to personalize their browsing preferences on websites that autoplay media with sound in order to minimize distractions on the web and conserve bandwidth. Users can customize media behavior with both global and per-site autoplay controls. Additionally, Microsoft Edge automatically suppresses autoplay of media in background tabs. Check out the Autoplay policies guide for details and best practices to ensure a good user experience with media hosted on your site. We've made further progress on our experimental CSS Masking implementation (behind the Enable CSS Masking flag) with added support for mask-composite, mask-position, and mask-repeat. For site compatibility, Microsoft Edge also supports the following -webkit- properties: -webkit-mask, -webkit-mask-composite, -webkit-mask-image, -webkit-mask-position, -webkit-mask-position-x, -webkit-mask-position-y, -webkit-mask-repeat, -webkit-mask-size. Additionally, Microsoft Edge now has support for overflow-wrap and partial support for overscroll-behavior (auto and contain values). DevTools in the latest Windows 10 update (EdgeHTML 18) has all the details. We listen to your feedback and have implemented support for several requested APIs in EdgeHTML 18, including the DataTransfer.setDragImage() method used to set a custom image when dragging and dropping, and secureConnectionStart, a property of the Performance Resource Timing API, which can be used for returning a timestamp immediately before the browser starts the handshake process to secure the current connection. In addition, no one likes enumerating the attributes collection, so we've added support for Element.getAttributeNames to return the attribute names of the element as an Array of strings, as well as, Element.toggleAttribute to toggle a boolean attribute (removing if present and adding if not). The Windows 10 October 2018 Update introduces the Make text bigger setting for improved end-user acessibility, and PWAs installed on Windows (in addition UWP and most desktop apps) now support this feature automatically. For PWAs and WebView controls, text scale works the same way as DPI scaling. If a user changes both text scale and DPI scale, the result is the product of the two. For design guidance, check out the Text scaling UWP guide on Windows Dev Center. For a refresher on what Service Workers are and how they work, check out the Service Worker API summary written by our partners over at MDN. There were several updates to Microsoft Edge supporting Service Workers in EdgeHTML 18. The fetchEvent enables the Service Worker to use preloadResponse to promise a response, and the resultingClientId to return the ID of the Client that the current service worker is controlling. The NavigationPreloadManager interface provides methods for managing the preloading of resources, allowing you to make a request in parallel while a service worker is booting-up, avoiding any time delay. Check out the newly supported API properties for the list of Service Worker preload methods and properties. Microsoft Edge now includes unprefixed support for the new Web Authentication API (aka WebAuthN). Web Authentication provides an open, scalable, and interoperable solution to simplify authentication, enabling better and more secure user experiences by replacing passwords with stronger hardware-bound credentials. The implementation in Microsoft Edge allows the use of Windows Hello enabling users to sign in with their face, fingerprint, or PIN, in addition to external authenticators like FIDO2 Security Keys or FIDO U2F Security Keys, to securely authenticate to websites. WebDriver is now a Windows Feature on Demand (FoD) making it easier than ever to automate testing in Microsoft Edge and get the right version for your device. You will no longer need to match the build/branch/flavor manually when installing WebDriver, your WebDriver will automatically update to match any new Windows 10 updates. You can install WebDriver by turning on Developer Mode, or install it as a standalone by going to Settings > Apps > Apps & features > Manage optional features. For more information, check out the WebDriver announcement on the Windows Blog site. In the Windows 10 Action Center. The source of these notifications should be understood as from a WebView hosted from a Win32 app. In the device access settings UI (Settings->Privacy->Camera/Location/Microphone). 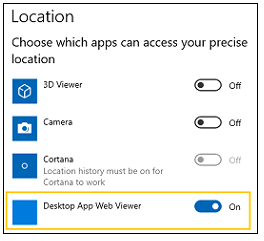 Disabling any of these settings denies access from all WebViews hosted in Win32 apps. With EdgeHTML 18, we are retiring the XSS filter in Microsoft Edge. Our customers remain protected thanks to modern standards like Content Security Policy (CSP), which provide more powerful, performant, and secure mechanisms to protect against content injection attacks, with high compatibility across modern browsers. Check out the full list of new APIs in EdgeHTML 18. They are listed in the format of [interface name]. [api name]. Although the following APIs are exposed in the DOM, the end-to-end behavior of some might still be in development and hidden behind an experimental flag. Refer to Microsoft Edge platform status for the official word on feature support. See the Pen New APIs in EdgeHTML 18 by MSEdgeDev (@MSEdgeDev) on CodePen.